It’s hard to find freedom when you’re stuck between what you want and what everyone else expects. A dictionary would tell you that the Chinese philosophical principles of “yin and yang” describe how apparently opposite or contrary forces can be complementary and interconnected. This paradoxical duality of oppositional forces is at the heart of the narrative and within the main characters of Ang Lee’s 2000 martial arts romance, Crouching Tiger, Hidden Dragon. The following essay will reveal major spoilers, though not for everything in the movie. 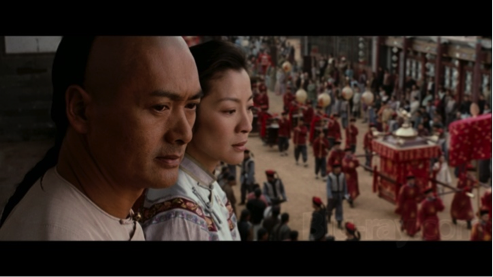 We feel the tension of duality in the core relationship between the swordsman Li Mu Bai (Chow Yun Fat) and female warrior Shu Lien (Michelle Yeoh) right from the beginning. 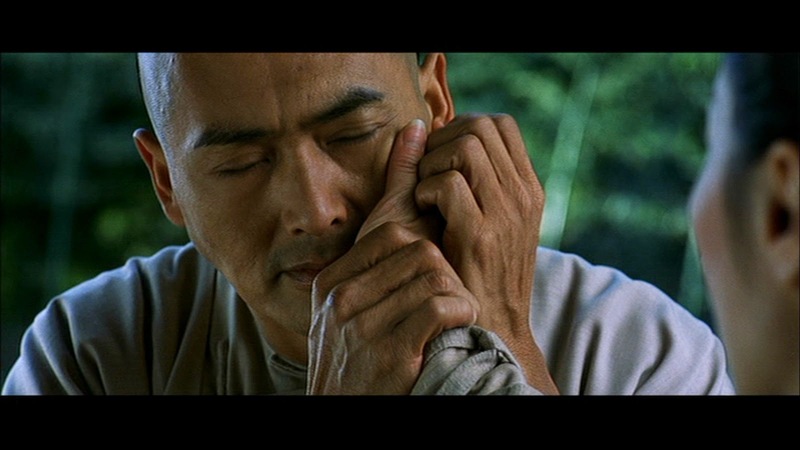 In the opening scene, Mu Bai surprises his long-time friend Shu Lien with the news that he wishes to retire from his life as a swordsman, despite his success and the unfinished revenge against the criminal Jade Fox (Chang Pei-pei) for the death of his master. Shu Lien asks why he wishes to retire, and we immediately understand the answer when Mu Bai gazes back at her, respectfully, but full of a longing strengthened by the years they’ve known each other. Even though Mu Bai is offering to discard his responsibilities to be with her, Shu Lien does not respond. We find out later that Shu Lien was once engaged, but her fiancé died before they could wed; as an honorable woman, she cannot marry anyone or she would disgrace the memory of her fiancé. How is she to choose? She is spared the awkwardness of an answer when the Green Destiny is later stolen, allowing her to avoid a decision. Throughout the story, Shu Lien becomes more open about her feelings for Li Mu Bai, even warming up to actual conversations about their relationship. This would seem rather mundane to a modern audience, but in the context of 18th century China, Shu Lien’s candor is unusual, especially for a woman considered a widow. Their conversations lead to a growing emotional intimacy, and though their relationship is never fully requited (and thus their respective conflicts not fully resolved), their parting at the end is tender and courtly. The investigation of the theft leads Shu Lien to Jen (Zhang Ziyi), the daughter of an aristocrat who is pledged to an arranged marriage that benefits her father. She is envious of Shu Lien’s freedom to settle her own affairs, either with her mind or her fists. This desire for freedom is not an idle one as we discover that Jen is not only the thief of the Green Destiny, but a kung-fu prodigy, trained in secret for years by Jade Fox. In Shu Lien, the Jen sees a possibility of a life where she can be her truly empowered self, free from the grasp of all the adults who feel like her potential, whether marital or martial, owes them something. She also sees a mentor figure who lives honorably and out in the open, unlike her shadow tutelage with Jade Fox. The older woman sees in Jen a possibility of fulfilment in love (either in the arranged marriage or in Lo, Jen’s desert lover) with a future of stability and safety. And, having already sensed that Jen is the thief, Shu Lien perhaps remembers a version of herself in the younger woman’s tenacity, a version that has long since been tempered by wisdom and external obligations. Yeoh and Zhang are both excellent in their roles, but Yeoh in particular gets to do some dramatic work that she almost never gets to do, holding close-ups, and delivering emotional nuance without dialogue. The women form a friendship, which is only broken later when Shu Lien tries to persuade Jen to give up the sword. Jen refuses because Shu Lien has become like every other person who tries to control her, and Shu Lien needs to do the honorable thing, which is to return the sword to Li Mu Bai. The disagreement turns into the best fight sequence in the entire movie. The concept of duality seeps into the relationships of the smaller roles as well. Jade Fox is split between her love for her disciple Jen, who is basically her daughter and a statement of defiance against the men who refused to teach her martial arts, and her simultaneous hatred, stemming from the revelation that Jen has surpassed her in skill and refused to teach her. Jade Fox suffers from the mother/daughter tension of having given her disciple the tools to her freedom, but not receiving the expected obedience and loyalty in return. Jen has taken away her status as a mentor, which reduces her to just a common criminal, and that betrayal breaks her. Jade’s disappointment is felt by Li Mu Bai later, when he pursues Jen as his own worthy student. He sees into Jen as Shu Lien did, except where she sees a younger doppelganger, he sees someone who can fill the void in his life that Shu Lien cannot fill, as someone in whom he can invest his life, as a lover or as a mentor. The chase through the bamboo forest, with its swaying lush greens, slow motion, and ethereal score all point to a victory for Mu Bai for all of his persistence in pursuing Jen, but she refuses. She chooses the freedom of Green Destiny over whatever tradition bound wisdom the monk can offer. Ang Lee is, at first glance, a curious director for a martial arts movie. He has his own interesting dualities: born and raised in Taiwan but educated in the United States, not focused in one particular genre but always interested in characters. Lee repeatedly mentions on the director’s commentary that so many aspects of this movie were a fantasy or a dream to see come true, and his passion for the project is evident. As is his habit, he allows his female characters to carry the emotional and narrative weight of the story, paying particular care to the interactions between them; it’s actually quite rare to see just male characters in any of the scenes. There is a sense that he’s interested in the emotional complexity of his female characters. Not to paint in broad strokes, but Christopher Nolan seems to be a convenient counterpoint to Lee, in that Nolan is concerned with cerebral, abstract ideas, particularly in the obsessions of his male characters, while Lee dwells in an emotional space, exploring the conflicts of (mostly) female characters (one approach is obviously not better than the other, and I enjoy them both). In an industry that is notoriously slow in consistently giving women interesting work, Lee puts in two prime roles for women who are powerful, independent, and don’t spend every moment bickering about their relationships to men. Lee also mentions in his commentary that he’s fascinated about how women can interact with their hidden emotions in such repression and formality. This fascination can translate easily in a martial arts film, where hidden emotions are made manifest in the fighting. The ubiquitous Yuen Woo-ping handles the action; his best pieces of work here are the wirework and the centerpiece action sequence between Jen and Shu Lien. 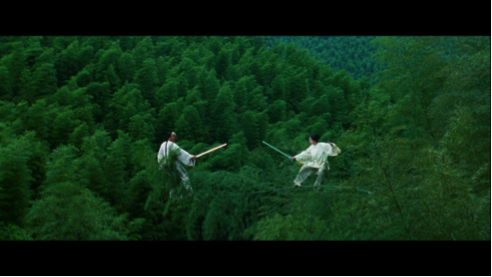 The flying sequences are notable in that they play along with the “soft” style of martial arts mostly used in the film (“soft” characterized by sweeping, deflective movements); the characters are not necessarily making explosive jumps, but seem to act on a natural weightlessness. The smooth, floating quality of the wirework makes it distinct from other movies and adds to the romantic tone that Lee is after (along with the iconic, classical score). The set pieces are excellent, and notable that they’re almost all with weapons. This was Chow Yun Fat’s first traditional martial arts film (which I found hard to believe) so all of his swordwork was brand new. The quality of the fighting is excellent amongst the principal actors, with little effects other than the wires, as far as I can tell. My favorite part of the action is that Michelle Yeoh gets to show off her considerable skill with no less than five weapons throughout the movie, which is no less than what an action star of her caliber deserves. I was worried about coming back to revisit this movie, even though I’ve enjoyed it every time I’ve seen it. I wondered if I just liked it for the action and overly respected the place it holds in my memory as the first martial arts movie I’d seen in theaters. It certainly came along at a fortunate time, riding the wave of the kung-fu popularity started by The Matrix, and penetrated the Western market in a way that Jackie Chan and Jet Li hadn’t yet been able to do. Fortunately for me and for martial arts lovers, it was really good, and it helped movies like Zhang Yimou’s Hero and House of Flying Daggers, Stephen Chow’s Kung Fu Hustle, and the Kill Bill movies gain a little more traction. 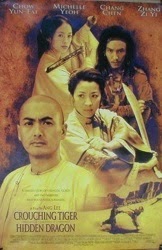 I’m cautiously excited about the prospect of a sequel (Crouching Tiger, Hidden Dragon II: The Green Destiny) which is currently filming, although I don’t think it will hit the same themes of duality and opposition that the first did. Yuen Woo-ping is directing, and his efforts tend to be heavier on the action rather than drama. In a cultural climate where audiences are noticing that their blockbuster action/hero movies are glaringly homogeneous, it’s reassuring that a little passion project, unlikely as it was to appeal with its foreign actors and subtitles and niche genre and inexperienced director, can leave such an enduring legacy. Welp, now I have to watch this again. You made me want to see this movie again, so you have written a successful review. One of the things that interested me with this movie at the time it came out was the emotional depth. I'd seen a lot of kung-fu movies before this came out, but never one that had been quite this willing to be this deep and serious about things that weren't men shouting and beating their chest and declaring that this time it would be different. I came back to watching this after several years, and the re-watch was pretty rewarding in how much depth I was able to see. Hope you have a similarly rewarding experience also. I might be exposing my naivete here, but this is so different than most other things in the genre. Really great column. Makes me want to re-watch the movie. So is she like dead at the end or what? I think she flew away into the House of Flying Daggers with Chris Tucker. And then went inside the Jules' suitcase. Just to be serious for a second, I don't think she's dead, although her death is a very reasonable interpretation. She's already demonstrated that she can fly, so falling off a mountain wouldn't seem to be a problem for someone of Jen's martial arts skill. The legend that the ending is referring from earlier in the movie says that a man threw himself off of a cliff to make his wish true, but not that the man had to die. Mark, great article. I have been looking forward to reading you insights on this film since you teased it a while back. For me this film was a sort of gateway to ideas of Wu Xia and Chinese film-making I did not had much contact with up until that point. Sure I had seen my share of Saturday kung fu cinema, but the stylistic themes and modalities Lee presents were quite new to me. Having seen it with a Chinese friend in collage, and they seeing my excitement for the film, quickly opened my eyes further to the genre. My friend, though enjoying the film, referred to "Crouching Tiger..." as being very "western", "Wu-Xia-lite" aimed primary at a western audience. Something I have seen since echoed in Chinese media as well. Either way, I loved it. Very soon I was watching everything I could from Tsui Hark and Zhang Yimou. I have not seen "Crouching Tiger..." in what is probably 12 years, mostly a little apprehensive that it won't stand up next to all I have learned and seen since. As for Ang lee, he is a very interesting director with quite a hodgepodge of films to his credit. I prefer his character study style films in which "Crouching Tiger...." probably fits, along with what is my favorite film of his, "Eat, Drink, Man, Woman". If anyone has not seen that film, they should. It actually seems to cover many of the same beats and themes as "Crouching Tiger..." but does it in a different way and in present day Taiwan. Side note: I once read in an interview with Zhang Yimou that he hated "Crouching Tiger..." he called it watered down and too Hollywood. He decided to show the world what he thought was proper Chinese film-making on a grand scale, a proper wu xia epic. The film he came back with was "Hero" (2002). I hope you enjoy your re-watch, whenever you get back to it. I really started loving this film more this time around. I can totally understand your Chinese friend seeing it differently, but I think that goes along with Ang Lee, who is very Chinese but also very Westernized as well. Eat, Drink, Man, Woman is terrific, and is something I need to revisit. I need to not eat dinner before, though, so I can splurge on Chinese food after watching it. I had not perceived any romantic undertones between Li Mu Bai and Jen; only a potential master-apprentice relationship for martial arts training. Is his intent more apparent in the original dialogue? There is reference to it here. Any further discussion in the original book, or by Ang Lee or the screenwriter? I don't think it was MORE apparent in the original; I think it's hinted at a little bit in the interaction between Mu Bai and Jen, and mirrored in Jade Fox's description of her relationship with Mu Bai's master. It doesn't seem too far fetched that he finds a romantic interest in Jen, since his relationship with Shu Lien won't ever be requited. I'm unaware of whether Ang Lee or James Schamus mentions it in other interviews; it could be that it is hinted at in Wang Dulu's original text. Thank you for the reply, Mark. Here is a detailed analysis that agrees with the interpretation. Incidentally, it also considers the main characters to represent of Taoism, Confucianism, and Zen (Chan) Buddhism. Thanks for the links, Ivan. I hadn't heard of that particular spiritual reading before.